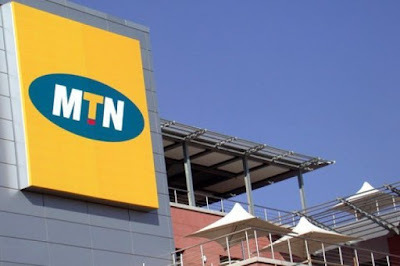 MTN Nigeria has announced that it has completed its conversion from a private company to a public company. The telecoms company in a statement on Wednesday said the conversion to a Plc was a legal requirement and key milestone in the preparatory process for MTN’s listing by introduction on the Nigerian Stock Exchange. 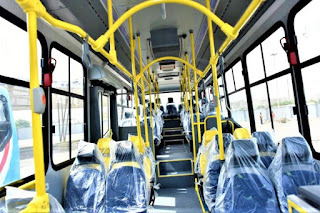 MTN said the proposed listing on the NSE would create a new telecoms asset class for investors and provide a wider group of Nigerians with a chance to participate in the MTN investment opportunity. 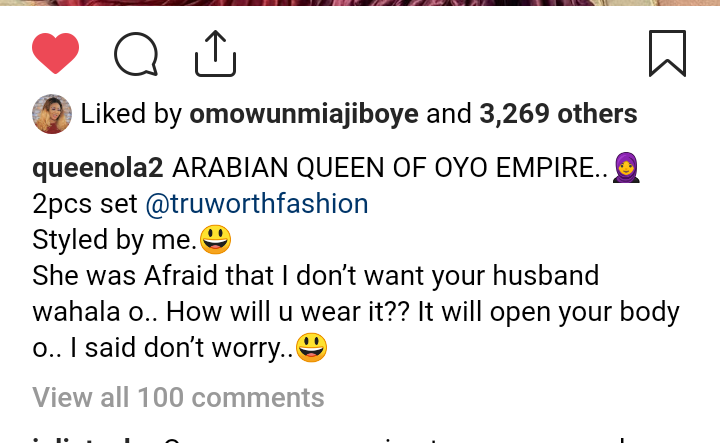 ARABIAN QUEEN OF OYO EMPIRE. 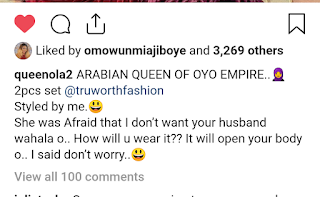 She was Afraid that I don’t want your husband wahala o.. How will u wear it?? It will open your body o.. I said don’t worry.. 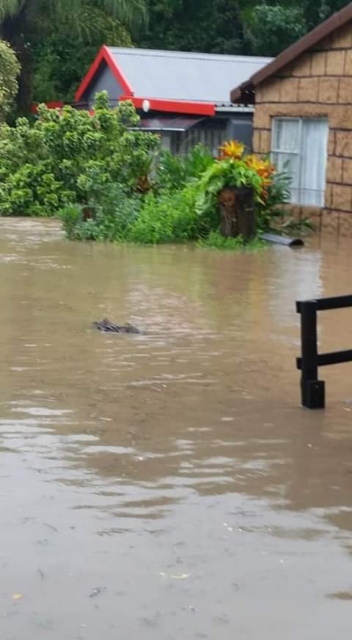 Severe downpour across KwaZulu-Natal has had tragic overnight consequences. The Durban floods have claimed the lives of 30 residents, including four who were caught in a house that collapsed. The rain has battered eThekwini and there was traffic chaos all across the municipality on Tuesday morning. A severe weather warning remains in place for the region. The rain is set to continue late into Tuesday, heaping the misery onto local residents. As the SA Weather Service confirmed, more localized flooding is expected over the coastal areas of KZN as well as the adjacent interior. 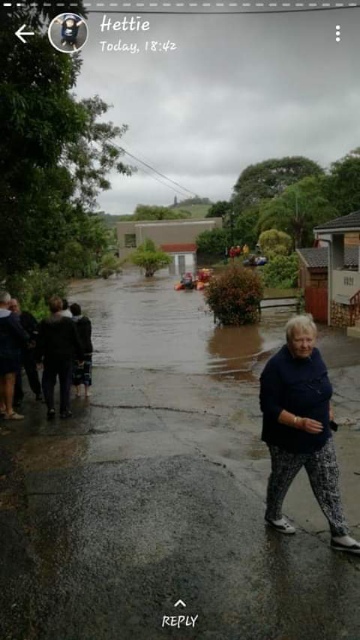 Chatsworth, Malvern and Overport are some of the suburbs which are worst-affected by the devastating Durban floods. Of the 23 deaths confirmed by authorities, four of them – including an infant – were claimed in the same house-collapse during the worst of the weather. Nollywood actress, Tonto Dikeh is the recent cover star of Vivian Lam Glamour Magazine. 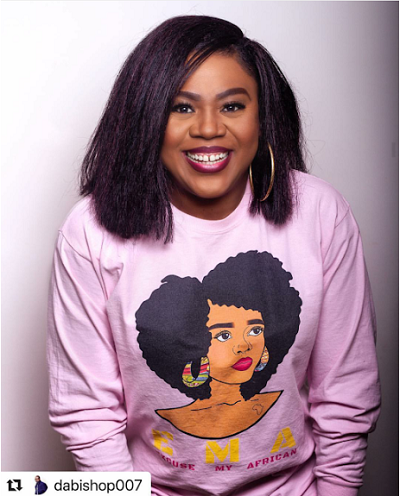 The controversial star shared a couple of pictures from the photoshoot on social media. 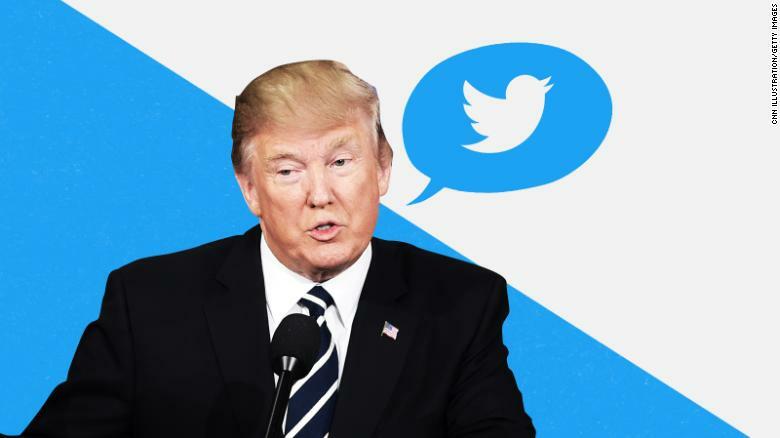 A large percentage of the meeting, which included senior White House officials such as Trump’s social media director Dan Scavino, was spent addressing the subject of @realDonaldTrump’s follower count. The president stated his belief that he had lost some of his roughly 59 million followers in anti-Trump, anti-conservative Twitter purges, according to a source familiar with the meeting. Dorsey, according to this knowledgeable source, had to explain to the president that like other Twitter users, @realDonaldTrump periodically loses followers when the site deletes fake or bot accounts. Dorsey even said he himself had lost followers as a result of Twitter’s efforts to delete fake accounts. During this private gathering in the West Wing, Dorsey assured Trump that the company wants him, and everyone else on Twitter, to have only real followers, according to the source. Trump also said he’s heard from other prominent conservatives about problems with Twitter, though he declined to name names. 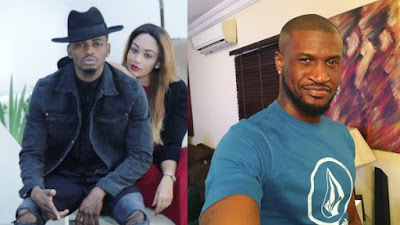 Zari who few days ago showed off her new man, has reacted after Diamond Platnumz accused her of cheating on him with Peter Psquare.In the viral video, the Tanzanian singer said his baby mama also had an affair with her Kenyan personal trainer. 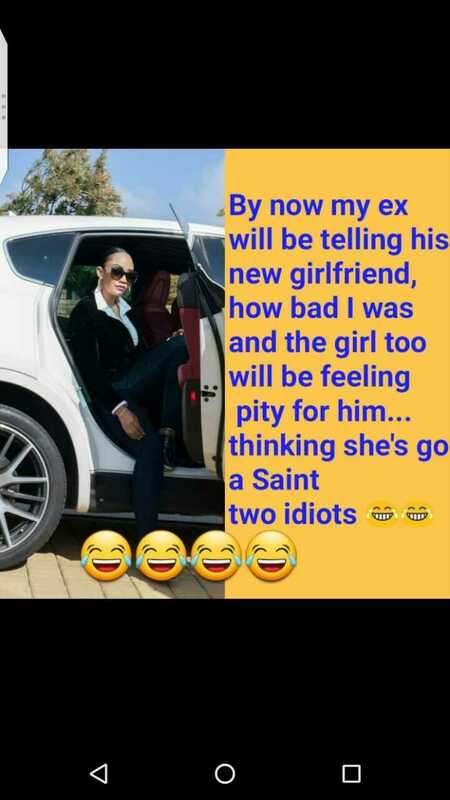 According to him, he forgave Zari for the affairs which he knew about, because he was also moving out in the relationship. 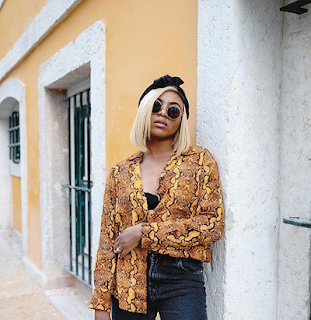 The singer revealed that the cause of the rift between the two was majorly the distance that forced him to become unfaithful as he needed a companion and that video call was not enough.Platinumz also said said that it was true that he had not paid child support for his children who lived in South Africa for a few months as he felt that Zari was using the children to hurt him by denying him access. However Zari who reacted, denied the claims and further asked fans not to believe him. US based actor Stella Damasus is a year older today and she and her husband Daniel Ademinokan showered each other with Encomium. 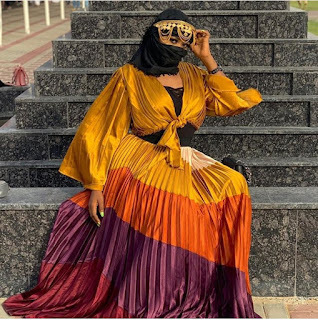 Zainab, a student of Maitama Sule University, Kano, had travelled from Mallam Aminu Kano International Airport (MAKIA) in company of her mother, Mrs. Maryam Aliyu, and sister, Hajara Aliyu. 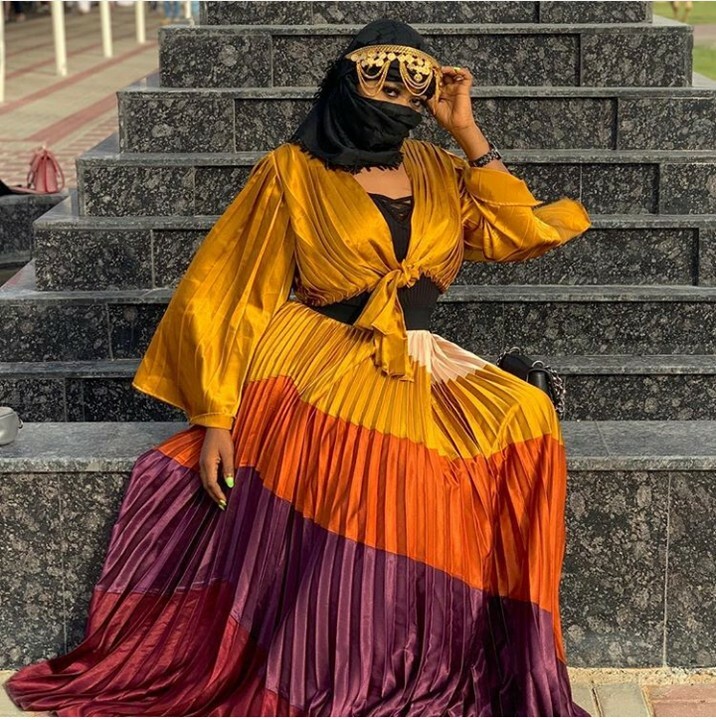 Zainab was arrested by Saudi Arabia Police on December 26, 2018 shortly after arriving for Lesser Hajj over allegations that a luggage, bearing her name tag, contained the unlawful substance. The Minister of Labour and Employment, Chris Ngige has said that he is not bothered about medical doctors leaving Nigeria, to practice outside the country. 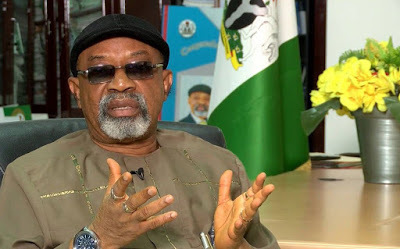 Ngige who was a guest on Channels TV Sunrise Daily, said the practice is not alien to Nigeria, because he was taught by Indians in secondary school. “I’m Not Worried, We Have Surplus (Doctors), if we have a surplus, we export. I was taught Biology and Chemistry by Indian teachers in my secondary school days. “They are surplus in their country. We have a surplus in the medical profession in our country. I can tell you this. It is my area, we have excess. We have enough, more than enough, quote me,” he said. 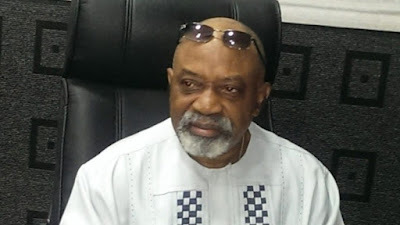 Ngige, when asked if nothing was wrong, owing to his position as a qualified medical doctor, said there was nothing wrong in their choice to practise overseas, at the detriment of Nigeria’s health sector. 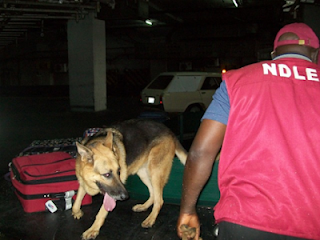 “There is nothing wrong, they go out to sharpen their skills, earn money and send them back home here. Yes, we have foreign exchange earnings from them, not from oil. “Those guys go there, they are better trained because of the facilities they have there. Eventually, I know a couple of them who practise abroad but set up medical centres back home. They have CAT scan, MRI scan which even the government hospitals cannot maintain. So, I don’t see any loss. “Brain drain will only be inimical when for instance neurosurgeons travel and we don’t have neurosurgeons here,” Ngige added. 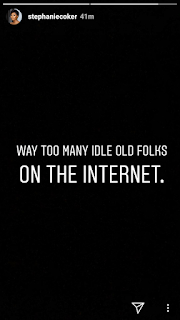 Media personality and entrepreneur, Stephanie Coker took to social media to rant about 'Idle old folks'. Taylor Swift ran with a top-shelf squad Tuesday night (April 23) as the pop superstar was honored in New York at the 2019 TIME 100 Gala. Taylor was the unofficial "social director" at the gala, notes TIME's Ashley Hoffman, as she posed for selfies with Khalid, Glenn Close and Trevor Noah, and caught up for a chat with Game of Thrones star Emilia Clarke. 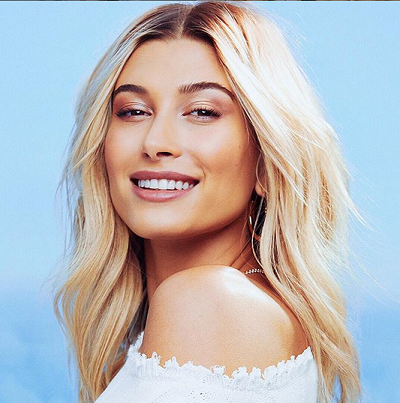 The supermodel opened up about her bouts with anxiety in a new interview with Glamour. “I admire people coming forward and talking about [anxiety]. We all struggle with it,” she said. “I think there’s been this stigma around it for so long. People look at celebrities who are famous or successful and think they have it all together." Bieber made headlines in late 2018 after it was confirmed she had married Canadian singer Justin Bieber. In case you forgot Scarlett Johansson has a massive back tattoo, and it was out in full force at the "Avengers: Endgame" world premiere in Los Angeles. The actress, who plays Black Widow in the Marvel Cinematic Universe, turned heads on the red carpet Monday night in a strapless, Swarovski crystal mesh Versace gown. But it was her elaborate ink that got people talking. Johansson, 34, has a black-and-white tattoo of a branch of roses on the right side of her back, starting close to her right shoulder and winding down past her waist. The world's highest-paid actress has a 5-year-old named Rose Dorothy with ex-husband Romain Dauriac, so it's possible the ink is inspired by her daughter. The floral tattoo is accompanied by a little lamb. President Buhari has arrived the Murtala Muhammed Airport (MMA) Ikeja Lagos for his one-day official visit to the state. The Presidential Jet with tail number 5N- FGT touched down at the airport around 10:30 a.m. 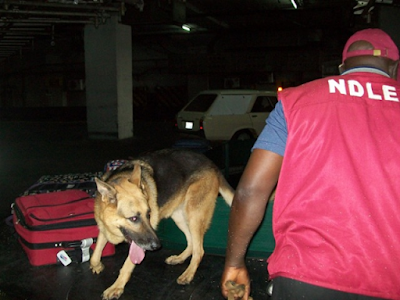 The Presidential wing of the airport has played host to many dignitaries ahead of the President’s arrival. There’s also heavy security in and around the airport as Senior government officials, Governors, among others made their way into the Presidential wing. Some of the dignitaries sighted by our correspondent are Governors Akinwunmi Ambode (the host Governor), Abiola Ajimobi of Oyo State, Ibikunle Amosun of Ogun State and Kayode Fayemi of Ekiti. Others are Deputy Governor of Edo State, Phillips Shuaib; Lagos Governor-elect, Babajide Olusola Sanwo-Olu and the Deputy Governor-elect, Femi Hamzat. 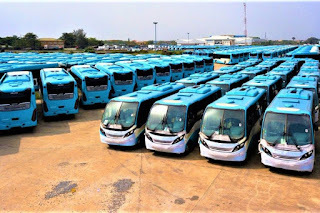 While in Lagos, the President is expected to commission the 10-lane Murtala Muhammed International Airport (MMIA) road; The Oshodi Transport Interchange; the 820 Air-conditioned new buses; the 170-bed Mother and Child Hospital; among others. 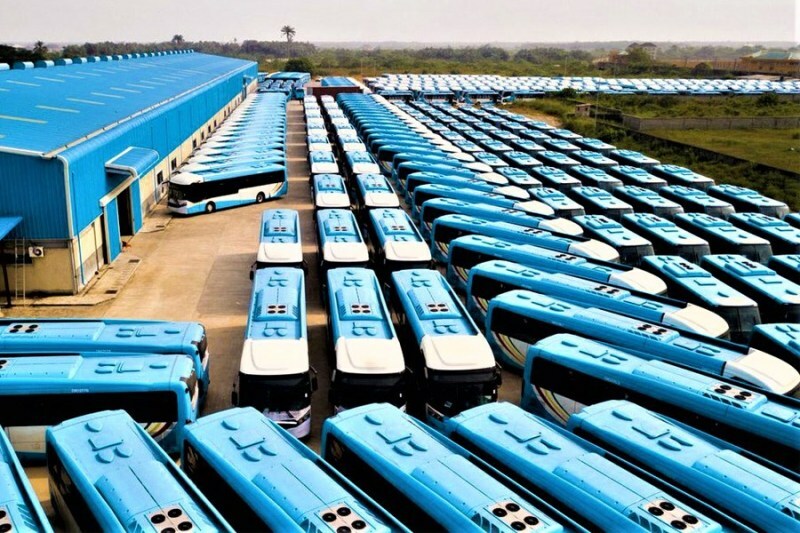 It is no longer news that President Mohammadu Buhari will be in Lagos today to commission some projects. 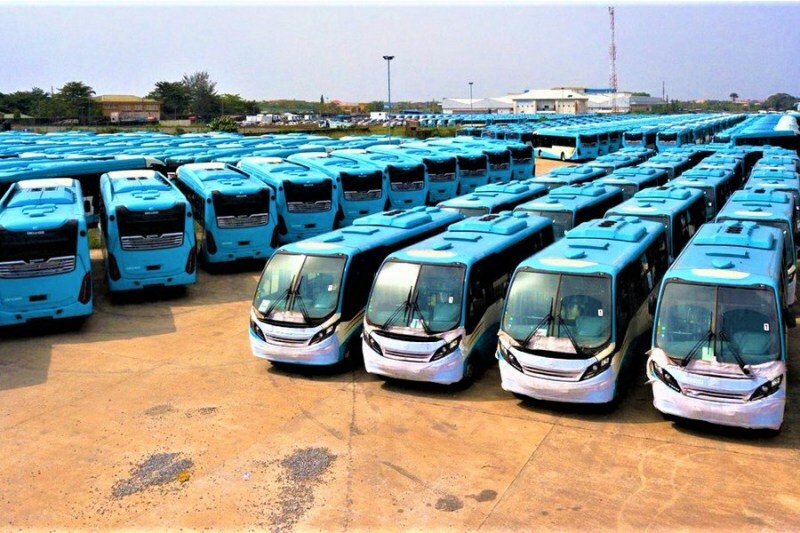 Part of the projects that the President will commission include a fleet of buses that is an integral part of the Bus Reform Project of the Governor Ambode-led government. 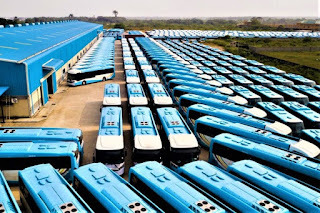 These buses have the unique feature of Intelligent Transport System mechanism. 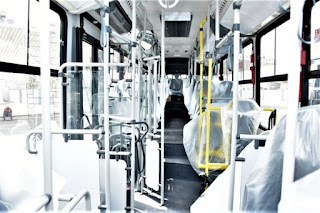 This mass transit mechanism is intended to aid Lagosians in planning their journeys. 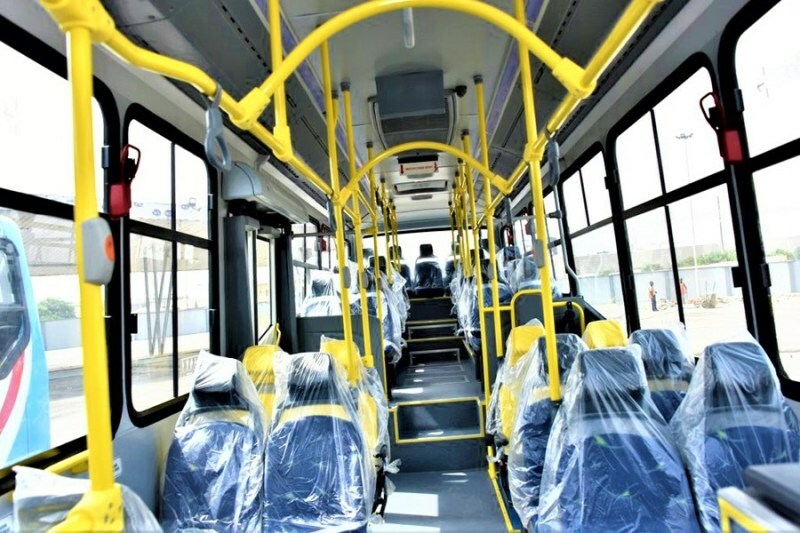 This initiative will also make public transportation in the state globally competitive. 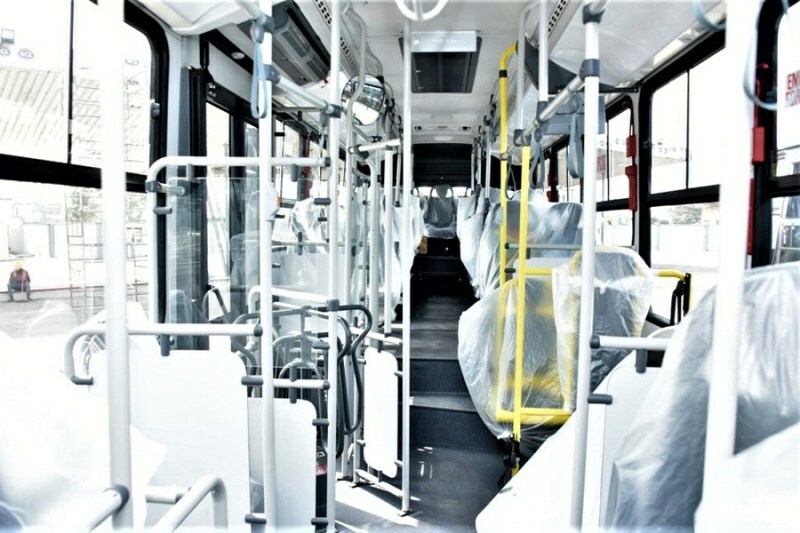 These buses are the first batch of 820 buses out of the 5000 buses being proposed for the bus Bus Reform Project. The beautiful actress just added to her fleet of luxury lifestyle as she received the delivery of her new Brabus. 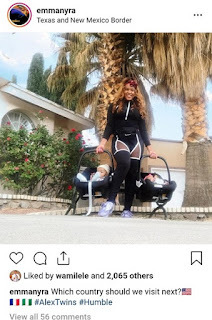 She shared pictures and video on social media as she posed with her new baby. The Kwara State House of Assembly on Tuesday passed a bill to restrain incoming government from dissolving the existing 16 local government councils of the state before the expiration of their three-year tenure. 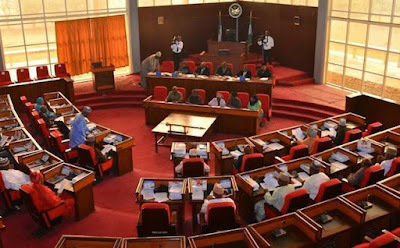 The bill, which is an amendment, is sponsored by Kamal Fagbemi (PDP-Okeogun) and passed after the members expressed satisfaction with all clauses contained in the document. The motion for the third reading and passage of the bill was moved by the House Majority Leader, Hassan Oyeleke. Before the passage of the bill, the lawmakers in their contributions, described as unconstitutional the dissolution of democratically elected local councils. The Deputy Speaker, Mathew Okedare, who presided over the plenary, directed the Clerk of the House, Halimat Kperogi, to prepare a clean copy of the bill for the governor’s assent. Mr Okedare said the third tier of government was strategic to accelerated socio-economic transformation at the grassroots. The last local government elections were held in the state on November 17, 2017 where all the 16 councils and the then All Progressives Congress won all the seats (APC). The members of the councils are expected to spend three years in office. They, however, defected to Peoples Democratic Party (PDP) shortly before the 2019 general elections. After a goalless first half, midfielder Carles Alena, 21, opened the scoring with a close-range finish following a sweeping attack by the visitors. Barcelona were awarded a penalty soon after following a VAR handball review and Uruguay's Luis Suarez converted. Victory means Barcelona will be confirmed as champions on Wednesday if Atletico Madrid lose to Valencia. The reigning champions are 12 points clear of Atletico, who have five games remaining. While Atletico could potentially still finish level on points with their title rivals even if they slip up on Wednesday, Barcelona will win the title by virtue of a better head-to-head record between the two sides. 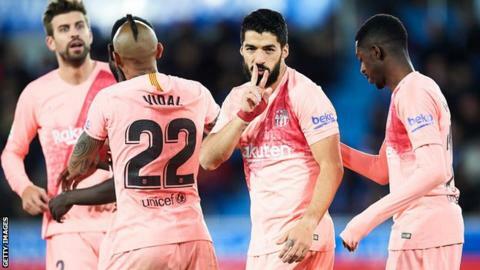 The result may mean Barcelona coach Ernesto Valverde rests players against Levante at the weekend before next week's Champions League semi-final with Liverpool. Valverde perhaps already had one eye on the first leg against Jurgen Klopp's side on Wednesday by opting to start Lionel Messi on the bench at Alaves. The Argentina forward came on just after an hour and went closest to scoring his 34th league goal of the season with a powerful strike from a tight angle that was tipped over by Alaves goalkeeper Pacheco. The Speaker of the House of Representatives, Yakubu Dogara, and his loyalists are in a fix over who to nominate that will challenge current House Leader, Femi Gbajabiamila, who has been adopted by the APC for the speakership of the 9th Assembly, Daily Trust has learnt. 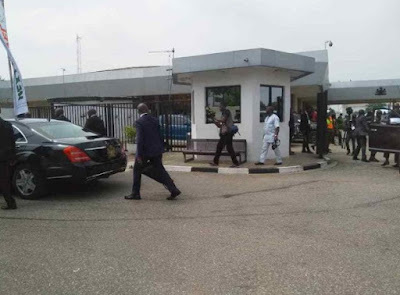 Sources within the National Assembly told our correspondent that Dogara and his loyalists had been meeting for the past weeks to decide on who to bring out to face the Gbajabiamila, but that they could not zero in on anybody. 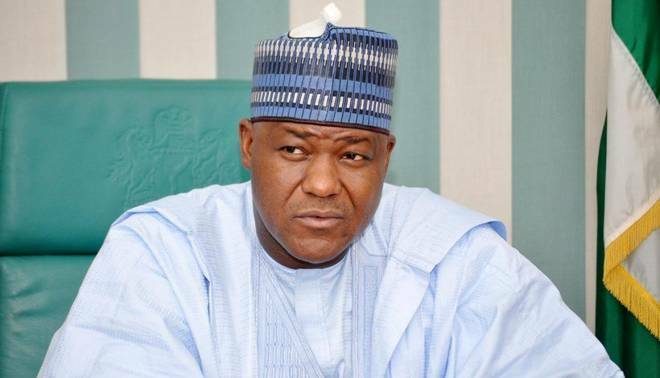 There were four members of Dogara camp contesting for the seat: Mohammed Umar Bago (APC, Niger), Abdulrazak Namdas (APC, Adamawa), Babangida Ibrahim (APC, Katsina) and Muktar Aliyu Betara (APC, Borno). However, while Ibrahim is from the same state with President Muhammadu Buhari, Namdas and Betara are from the North East, where the position of the senate president has been zoned to, and all the three major contenders for the number three citizen’s seat are from the zone. The three contenders for the senate president’s seat are Senate Leader, Ahmad Lawan (APC, Yobe), Sen. Mohammed Ali Ndume (APC, Borno) and Sen. Mohammed Danjuma Goje (APC, Gombe). Thus, it is believed that the positions of senate president and speaker cannot go to the same region. It was learnt that the Dogara loyalists would have settled for Bago who is from the North Central, but that most of them are reportedly not comfortable with him. Another of Dogara man, Ahmed Idris Wase (APC, Plateau), was in the race for the speakership until last week when Gbajabiamila’s adoption was made public. Sources said Wase would have been the candidate to give Gbajabiamila a tough time but that he had reportedly backed out of the race. After APC adopted the house leader and zoned the position of deputy speaker to the North Central, Wase immediately suspended his campaign. It was learnt that he is to be paired with Gbajabiamila as deputy. Daily Trust gathered that Dogara loyalists are now shopping for who they will support to challenge Gbajabiamila as none of the current contenders among them can match him. One of the Dogara loyalists told our correspondent that the decision to bring out somebody among them was taking time because they were still watching to see who to support. However, the source said the decision would be taken between this week and next as some of the Dogara loyalists had already started grumbling over the matter. “The truth of the matter is that for now, we don’t have a strong person that can challenge Gbaja. The scenario is quite different from 2015 when we had Dogara as a strong challenger. “But this time around, with the exit of Wase from the race and his readiness to be deputy speaker to Gbaja, we’re finding it difficult. No matter what, we have to take a decision on that soon. “The situation is even uncertain because Dogara himself has not indicated the person he wants among his loyalists. Some were even insinuating among us that he would want to contest, but he told some of us that he won’t contest under present circumstances,” the source said. On Tuesday morning Solskjaer said: "There will be fouls. They will snap at your ankles and heels and kick you." "Did he say that? With 65% or 70% possession, how do we do that?" said Guardiola. "I don't like it. My side is not built like that, not at all." Guardiola has previously denied accusations he tells his teams to commit 'tactical fouls' to halt opposition counter-attacks. Privately, City are bemused at United letting Solskjaer speak about the issue, mainly because the statistics do not back up the Norwegian's view. According to Opta, City have conceded 170 free-kicks, excluding off-sides, in the opposition half so far this season. In contrast, United have conceded 195. In addition, City have amassed 38 yellow cards and one red in the Premier League this season - for United, the figures are 64 and four. "In 10 seasons as a manager, I never prepared for a game thinking about these things. Never," insisted Guardiola. "In football, you sometimes do that [foul] because the actions are so fast. But I never said we should do it to punish an opponent or cancel them. Maybe after the game you can ask him in the press conference." In November, Guardiola was given a formal warning by the Football Association for speaking about referee Anthony Taylor before the previous Manchester derby at Etihad Stadium, which City won 3-1. In October, Newcastle manager Rafael Benitez was fined £60,000 for comments he made about Andre Marriner before a goalless draw with Crystal Palace. Marriner will be in charge at Old Trafford and, as FA rules specifically forbid managers speaking about referees prior to matches, Solskjaer risked a sanction when he said: "They [City] commit so many players forward and you can clearly see that they've got them in that mould of trying to win the ball back, and they do make fouls. "It's up to us to play through that press, be ready, play one and two-touch, don't give them time. If you spend two or three touches… it's not my decision, it's the referee's responsibility to do that." Asked if those comments could influence Marriner, Guardiola said: "That's the reason why, of course. "But I don't think it will be successful because we don't do it." Hip hop mogul, Diddy and all his children were featured in the latest issue of Essence magazine. 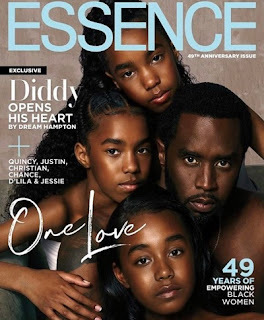 He shared the cover with his three daughters while his sons were featured inside the issue. 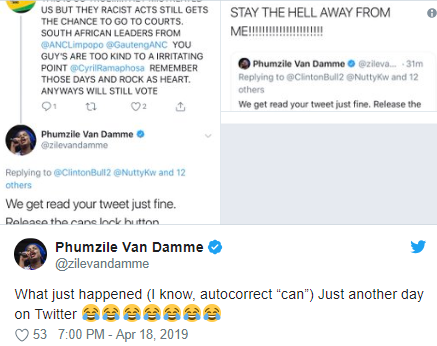 While many of us were gorging on Easter eggs or spending time with family over the long weekend, social media was more lit than a Christmas tree after Bonang and the Democratic Alliance's Phumzile van Damme found themselves in a spicy exchange on Twitter. 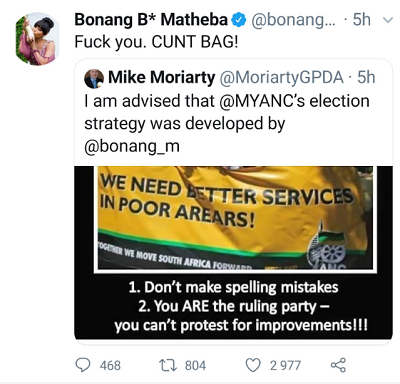 Bonang first got dragged into the drama when the DA's chief whip in the Gauteng provincial legislature, Mike Moriarty, weighed in on a spelling error seen on a supposed ANC banner by claiming that he was "advised that the ANC strategy was developed by Bonang". 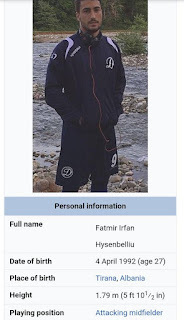 The legitimacy of the banner has not been verified. The comment was made in relation to several errors found in the first edition of Bonang's memoir, which was released in 2017. Bonang was not impressed and responded with one foul swoop. 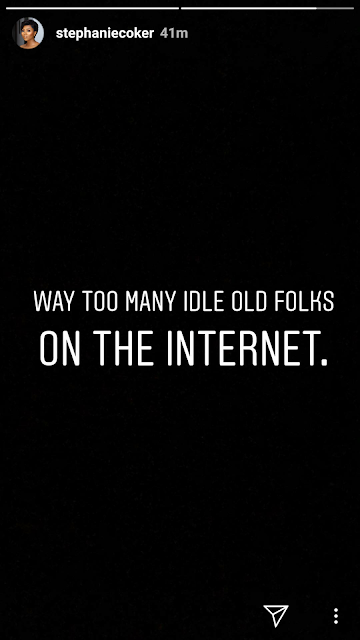 Soon the internet was in chaos mode as they tried to deal with the heated exchange. As Bonang found herself being spoken about left, right and centre, DA MP Phumzile Van Damme took to Twitter to tell a tweep who was commenting to switch off the caps-lock on their response. Next thing, Bonang responded to Phumzile's comment by telling her to "stay the hell away" from her. 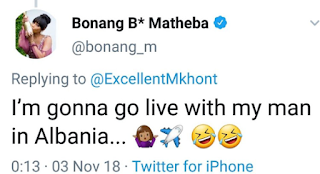 While Phumzile did not directly tweet Bonang and claimed that she had not directed any of her comments at the media personality, Queen B blocked Phumzile and claimed that the DA MP thought the situation was a joke. 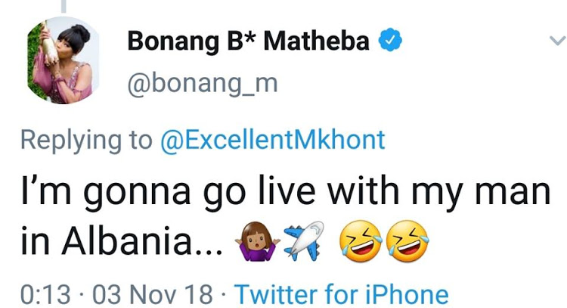 Bonang ended her comments on the matter by telling her followers that she was "so tired" of being bullied on social media - and then went on to post snaps of herself holidaying overseas. 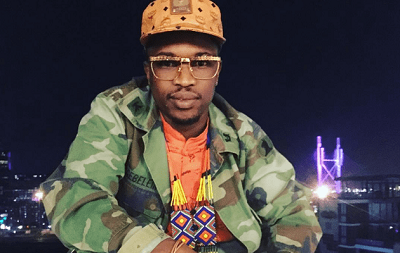 South African TV and radio personality Scoop Makhathini is still paying the price for a Twitter meltdown that not only saw him make headlines but also apparently resulted in him losing gigs overseas. 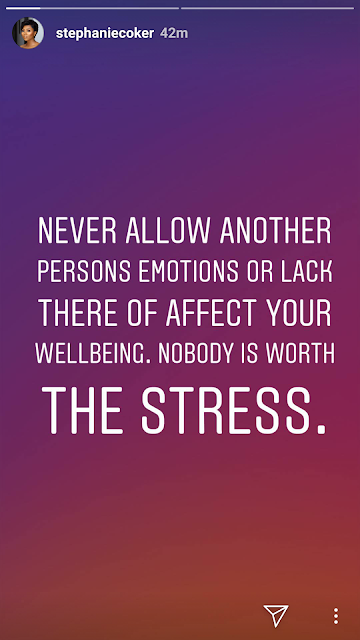 Scoop made headlines last week when a series of tweets from his account called out his girlfriend for chilling with another guy and claimed he was heartbroken. Social media users claimed that the star was in the middle of a "meltdown"
Scoop later claimed that his account had been hacked, and speaking on his YFM radio show recently he said the chaos took place while he was in studio with no signal. 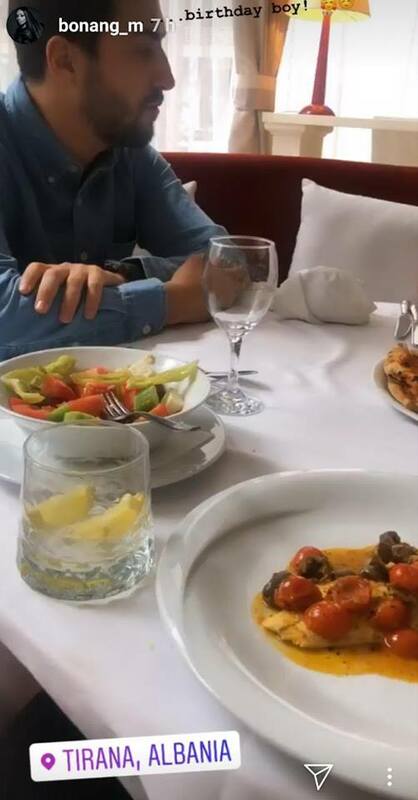 One of his friends, who was in Barcelona at the time, alerted him to the situation. He said he thought he could deal with it until it started affecting his coins. "I was sitting at home like 'Everything is going to be fine' and then the problem arises when I was supposed to sign two contracts this week, international contracts. I get a call and they are like 'Yo, man! We really don't know what is happening with your social media page because we really wanted to use that for the promo. So we definitely can't move on'". Scoop said that he was hurt by the incident but said it forced him to be strong. He also claimed on social media to have lost hundreds of followers after the hack. "I think I had like 500k plus, now I'm down to 105k. To those folk, I love and appreciate you guys for sticking with me. Nyan' nyan'. A great display of your characters." 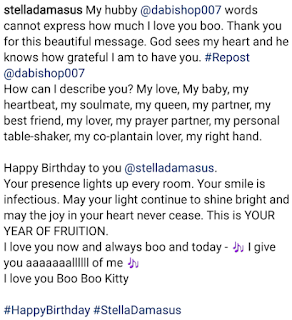 Meanwhile, his bae posted a series of messages on her social media reminding herself to not pay attention to the haters. Diamond Platnumz has made the internet go gaga after his recent interview on Wasafi TV. The star spoke about a lot of different facets of his life. 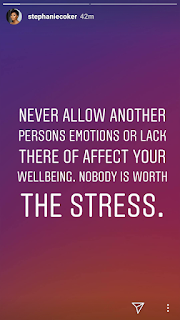 The one most care about is his relationship with Zari Hassan. 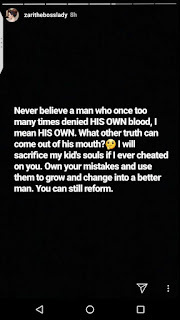 And he revealed that the mother of his two kids had cheated on him with various men. The singer admitted in the interview that he had loved Zari and was proud of her as the mother of his two kids. 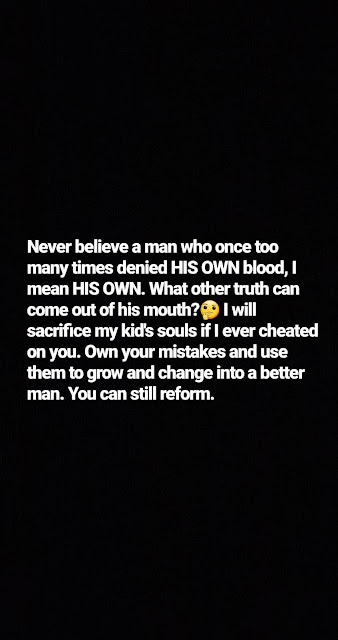 He also shockingly admitted that she had cheated on him various men. While confessing that he had also done foolish(cheating) things, he said that Zari had also been a transgressor. He said that the worst thing that his ex had done to him was with Peter from the huge Nigerian group P-Square. Diamond said that he saw the proof for himself on Zari’s phone. He said that he had found a message between her and Peter and confronted her about it, telling her that she was playing him. Chibu said that since he had many other things going on in his life that he decided to move on from the issue. That wasn’t the only shocking case of her infidelity according to the singer. He claims that the socialite also had a thing with a personal trainer that she had. He claimed that while he was still dating Zari, that she was cheating on him with her personal trainer, who would even come into their own home. He even added that he had pictures to prove what he was saying. The reason he had not divulged this information he said, was because he wasn’t that type of person. Diamond, however, admitted that his madness in the relationship might have contributed to Zari’s own indiscretions. 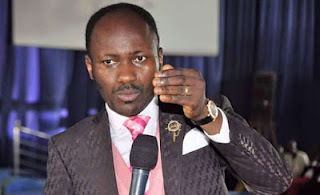 It’s a new Apostle Suleman so to say. The Apostle who recently threatened bloggers saying he has the powers to shut down any blog, has now taking to twitter this morning to continue what looks like a threat. 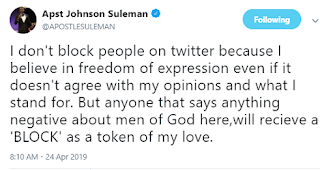 According to Suleman, anyone who says any negative thing about any man of God henceforth will now get a BLOCK from him. ''I don't block people on twitter because I believe in freedom of expression even if it doesn't agree with my opinions and what I stand for. But anyone that says anything negative about men of God here,will receive a 'BLOCK' as a token of my love'', he wrote few minutes ago on twitter. The singer who welcomed a set of twins few months ago has been focusing on her kids and saying... music can wait! She just went on a trip with her kids and now asking her followers which country they could visit again. ‘’Which country should we visit next? 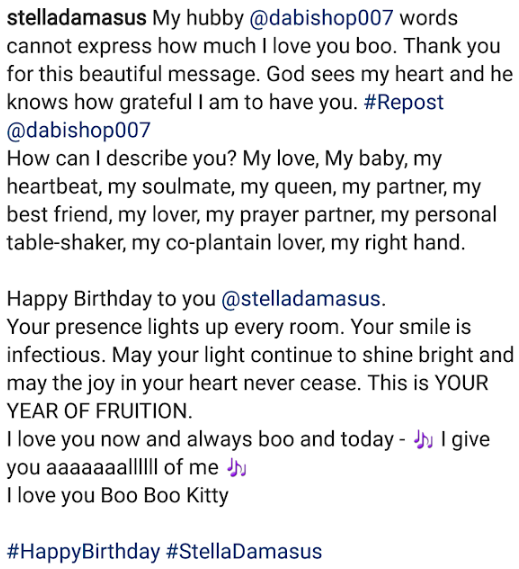 #AlexTwins #Humble’’, she captioned the photo. 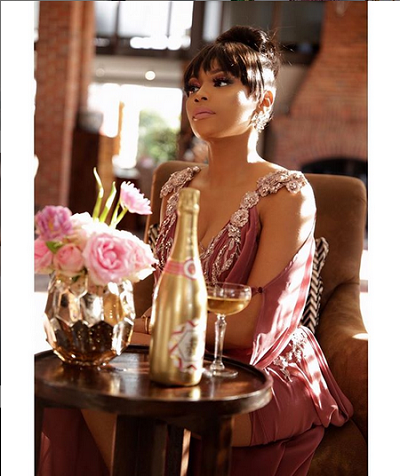 Fans have been sharing their observations that Bonang Matheba has been glowing like a woman in love, and while she's been coy about the whole thing, over the weekend B decided to play along after she was asked to show her "man". 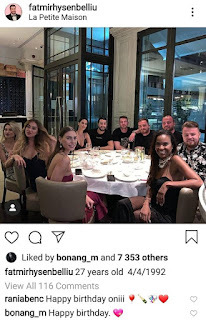 From past teasers moghel has shared, we know that the guy spoils her and is not a local citizen of Mzansi. So when Bonang replied to a tweep that she would go live with her man on Instagram stories, err'body got their data ready. They got some popcorns and some House of BNG champopo, and waited patiently for the "big reveal". A couple of minutes later, your girl B came through with the Insta stories, in the form of some of the snaps below. 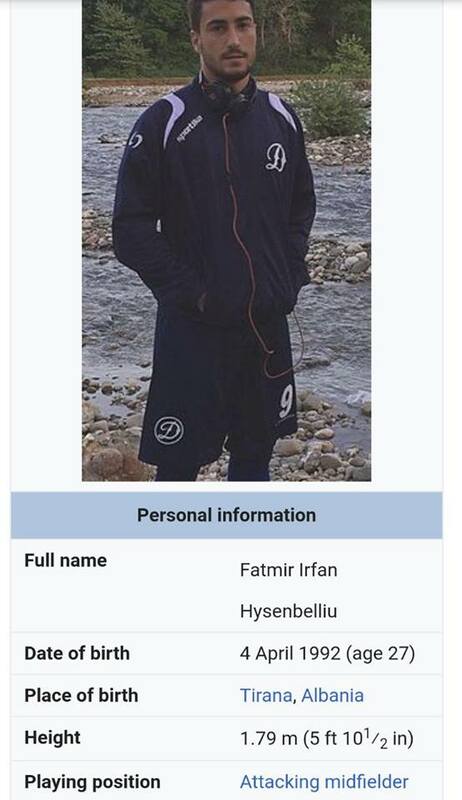 They found that the man's name is Fatmir Hysenbelliu. 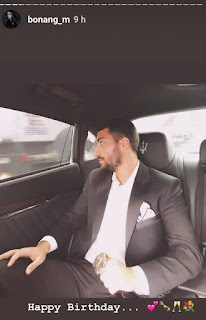 He is an Albanian businessman and retired footballer. He's 27 years and yummy AF! And while there's nothing on his social yet to imply that he and B may be an item, B has commented on his pics. Zari isn’t one to mince her words. She has embarked on an epic rant about her ex, Diamond. As always, she hasn’t mentioned him but instead referenced a situation he found himself in. Remember when Diamond was rumoured to have fathered a child by Hamisa Mobetto? When that rumoured begun getting whispered, he came out and vehemently denied Hamisa and their love child. And did so on so many different occasions, going as far as insulting Hamisa. In time, however, he came to accept his son by her and even acquiesced to her naming the boy after him. That says a lot about a man because men rarely have a reason to deny their children. Society doesn’t judge single fathers as harshly as it does single mothers. Hell, society stopped condemning deadbeat dads altogether. 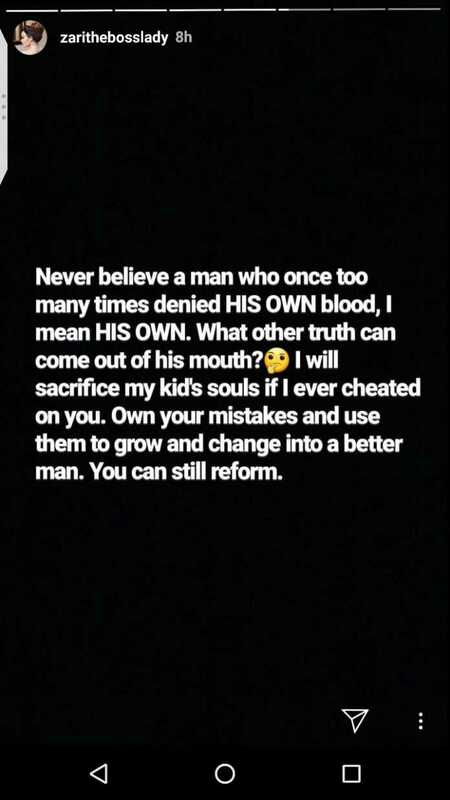 Zari has refocused us all on this incident that happened while she was still with Diamond in a common-law marriage to show us a despicable failing of the man. 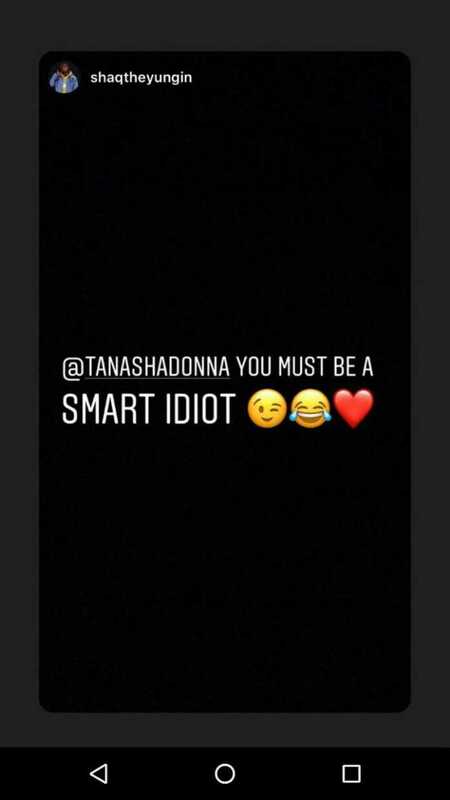 And she wants Tanasha to understand that such a man cannot be trusted! 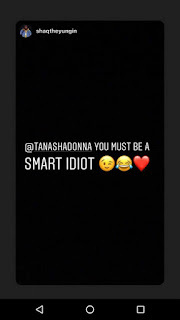 Zari went on to savagely attack Tanasha (unprovoked I might add) by calling her an idiot for buying into Diamond’s lies. It actually begs the question of whether Zari herself wasn’t swallowing Diamond’s lies for well over 3 years!